BetBright is pleased to announce the new Sportsbook welcome offer is out! New customers registering via this page will receive a 100% Matched Deposit Bonus up to £100! What are you waiting for? 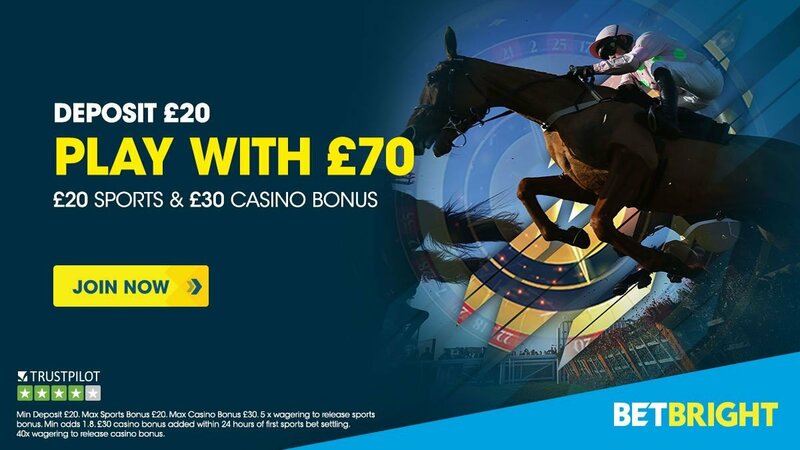 BetBright free bet - get up to £100 matched bonus! Deposit to your account to receive your 100% matched deposit bonus. Betbright will match your deposit bonus up to the first £100 of your initial deposit. Wager your deposit and bonus at least four times with minimum odds of 4/5 (1.80) to release your bonus funds to your cash wallet. BetBright is licensed and regulated by the UK Gambling Commission for the provision of facilities for gambling to customers in the UK. BetBright Sportsbook is a relative newcomer in the sports betting industry but it offers fantastic promotions and a high quality betting experience. The two sports that BetBright primarily focus on are horse racing and football. These sports are covered extensively, sports like tennis, golf and cricket are also well covered. BetBright also have one of the best mobile app and websites available on the market today. This offer available to new BetBright customers only, who set up their account through relevant material. You must tick the opt in box on the registration or deposit page while depositing to activate the offer. Customers who deposit to their account via Skrill or Neteller will not be eligible for this offer. Only debit / credit card deposits will qualify for this offer. Both the deposit amount and the bonus amount will be held as bonus funds until the bonus wagering requirement has been met. The total amount (deposit plus bonus) in bonus wallet must be wagered 4 times to release any bonus. Example: Customer makes deposit of £100 and receives the full bonus amount of £100. Qualifying deposit amount of £100 + bonus funds of £100 = £200. £200 must be wagered 4 times (£800) before the bonus funds and qualifying deposit amount are released to the customer’s cash balance. After registration, you have 4 days to deposit and opt in. You then have 60 days to complete the wagering requirement. If wagering is not completed within this time, any bonus funds will be removed and the promotion expired. Any funds remaining from your deposit (promo buy-in) will be returned to your cash wallet. The promotional buy-in wallet (your deposit including winnings from this deposit) can be withdrawn at any stage during the promotion however any withdrawal made with funds from this wallet while the promotion is still active, will cancel the promotion on your account and will forfeit the matched bonus funds. Any cash withdrawals made with funds from outside of the promotional balance will not cancel the promotion on your account. Once the wagering requirement has been completed, the promotional balance will transfer to your cash balance and will be fully available to use across the site or be withdrawn. Your bonus can be used on all sportsbook bets. Only bets placed at odds of equal to or over 4/5 or 1.80 will count towards the wagering requirement of the offer. Where multiples bets are placed, one selection from the multiple bet must be over the minimum odds of 4/5 (1.8) in order to contribute towards the wagering requirement. Only bets which have settled will contribute towards the wagering requirement of the offer. Your progress will update once your bets have settled. Voided bets, bets placed at SP, bets on the draw no bet market or non-runner bets will not count towards the wagering requirement. Qualifying bets which are cashed out will not count towards wagering requirement. Bets placed with free bets will not count towards the wagering requirement. Bets on virtual sports or casino will not count towards the wagering requirement of this promotion. Where the first bet is placed in a specific market, only the subsequent bets placed on that selection within that market will count towards the wagering requirement of the offer for both pre-match and in-play. For example, where a customer places a bet on Chelsea to beat Manchester United, if any subsequent bets are placed on Manchester United or Draw – this will not count towards the wagering requirement of the offer. Subsequent bets on Chelsea however will continue to count towards the wagering requirement. The customer agrees on opting in to the promotion that the value of the bet they place will always come from their bonus buy-in balance first (promotional deposit) if available, followed by funds from their bonus wallet and followed by the customers cash balance. Winnings from bets placed will be returned proportionately to all wallets. (For example, should a customer place a winning £50 bet at even money (2.0) with a promotional buy in balance £20 and a bonus balance of £20 and a cash balance of £10, winnings will be returned as follows: £40 to bonus buy-in, £40 to bonus wallet and £20 to the cash balance. Any bets placed which do not meet the promotional criteria outlined in these terms and conditions such as minimum odds will still be taken from balances in the above order however will not contribute towards the wagering requirement. Promo Buy-in balance first then Bonus Wallet and then Cash balance. Any bets placed with a cash balance that sits outside of the promotional balance will not contribute towards the wagering requirement of the offer. Duplicate accounts will not qualify for this offer. Only one new account offer per customer, household address, e-mail - address, debit / credit card number or IP address is allowed. You can only have one active bonus at any given time. This offer needs to be completed prior to any other offer being added to the account. Bets placed with bonus funds will not qualify for any other promotional offers on site. BetBright Standard Terms & Conditions apply. BetBright reserves the right to terminate this promotion at any time. "BetBright Free Bets: up to £100 Matched Deposit Bonus"